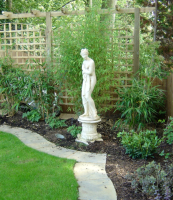 "We are very pleased with the garden which Barry designed, which has been much admired by friends and is a significant improvement on the previous design. Barry and his team worked hard and efficiently, causing minimal disruption. I would gladley recommend Barry West to anyone. Barry interpreted my designs extremely well and produced a lovely garden from what was previously a mess. Friends and neighbours have all loved the result and I now have a beautiful garden that is easy to manage and that I love spending time in. The work was carried out in a very professional and timely manner and I would not hesitate to recommend BSW landscapes to anyone"
Barry, I'd just like to say a big thank you to you and your guys for the great jobs you've done for me at home. Both front and rear gardens are really taking shape now that the planting is maturing but the landscaping design has proven to be extremely successful. I would have no hesitation in recommending your services"